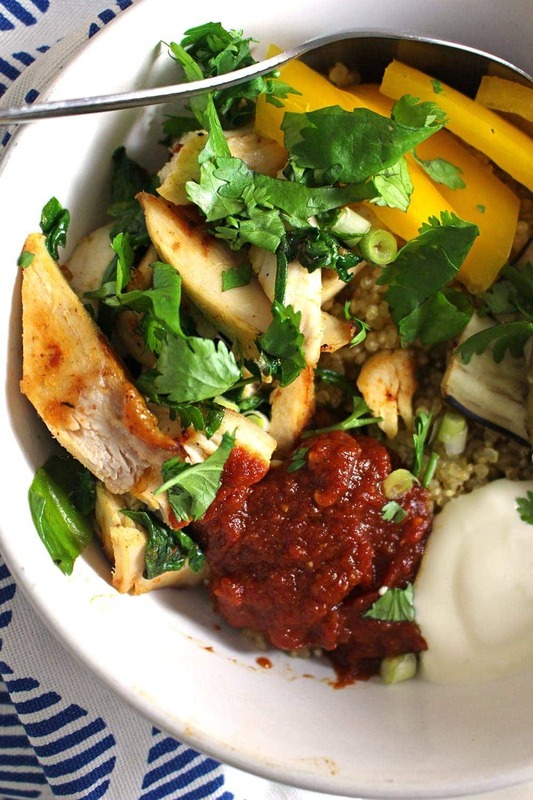 These chipotle chicken quinoa bowls are perfect for using up leftover roast chicken. A simple and healthy dinner, use any veg you have and make it your own. There’s something about calling a meal a ‘bowl’ which makes it sound immediately more appealing don’t you think? It’s like the act of eating out of a bowl means that you can curl up around it on the sofa in front of the TV (we’re currently obsessively watching OITNB, what about you?). These bowls are pretty much a mishmash of some of my favourite things. I used quinoa because a) it’s super healthy b) I wanted to be cool like everyone else that eats it on the regs and c) because they sell it for really cheap in the shop at the end of our road. I also used up the chicken from making this recipe for slow cooker chipotle chicken quesadillas which you could totally do! We had leftover chipotle sauce from that recipe as well which I used in these bowls but you could easily grab some store bought chipotle sauce to use instead. I added some chopped up raw yellow pepper and a big handful of fresh coriander to these which made them feel really refreshing and healthy. The leftover chicken was crisped up in a pan with a handful of baby spinach just to make it even more healthy. 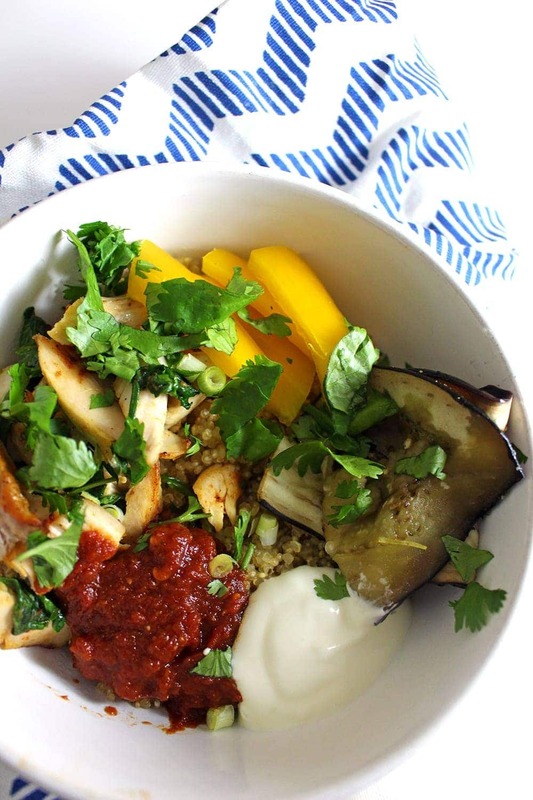 This bowl also features one of my other favourite things which is roasted aubergine. All of this stuff is piled on top of the quinoa in a bowl (obvs) and I added a dollop of sour cream and a sprinkling of chopped spring onions to finish it all off. Amazing! Heat the oven to 200°C. 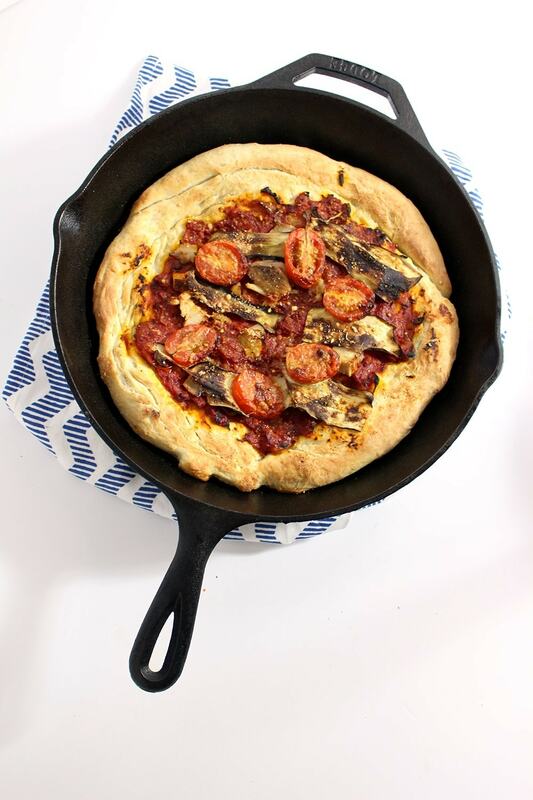 Sprinkle the slices of aubergine with salt on both sides and leave for 5 minutes to draw the moisture out. Pat dry with a paper towel. Place on an oiled baking tray in a single layer (you might need more than one baking tray) and sprinkle with a little more salt and some pepper. Place in the oven for 15-20 minutes. Heat the olive oil over a medium high heat then add the chicken and cook for a minute until crispy. Add the spinach and allow to wilt for another minute until removing from the heat. 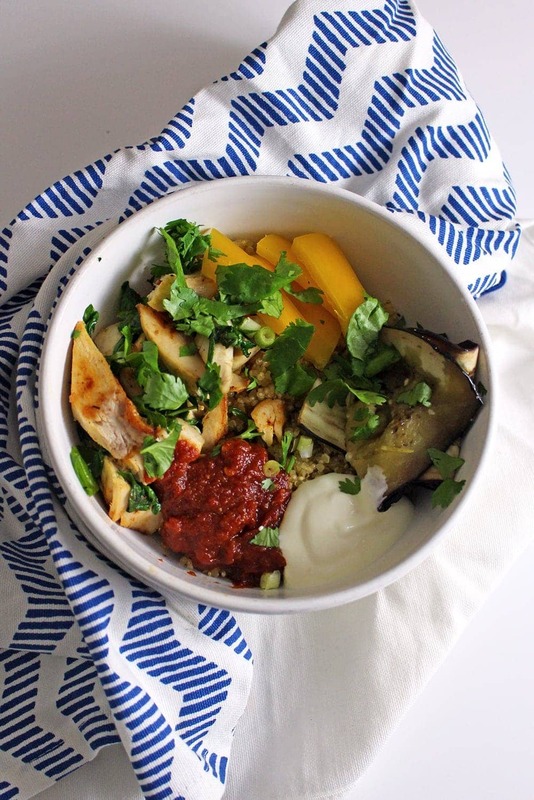 Place the cooked quinoa into bowls and top with a helping of chicken and spinach, some yellow pepper, chipotle sauce, sour cream, aubergine slices, coriander and spring onion. 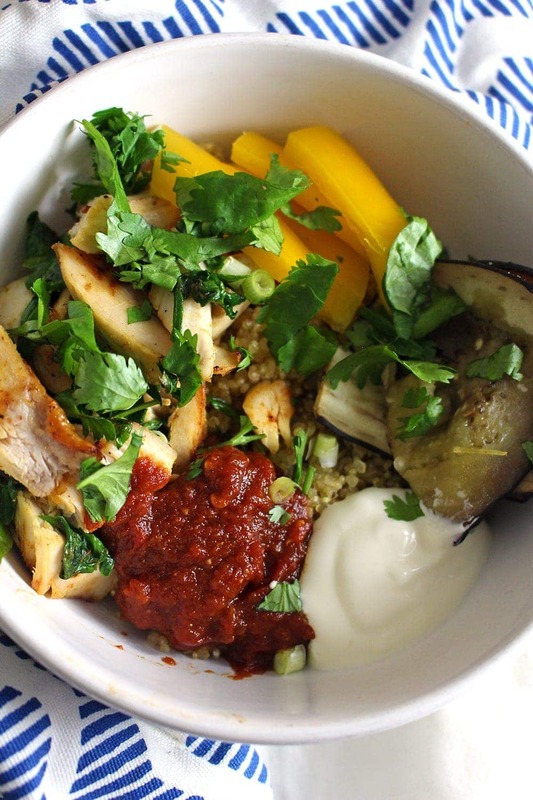 WONDERING WHAT TO DO WITH THE LEFTOVER INGREDIENTS YOU’VE GOT FROM MAKING THESE Chipotle chicken quinoa bowls? Mmmm I love having dinner all combined into one bowl… easy, great way to reuse leftovers! So glad you put chipotle sauce with that couscous and spinach bowl. Delicious! 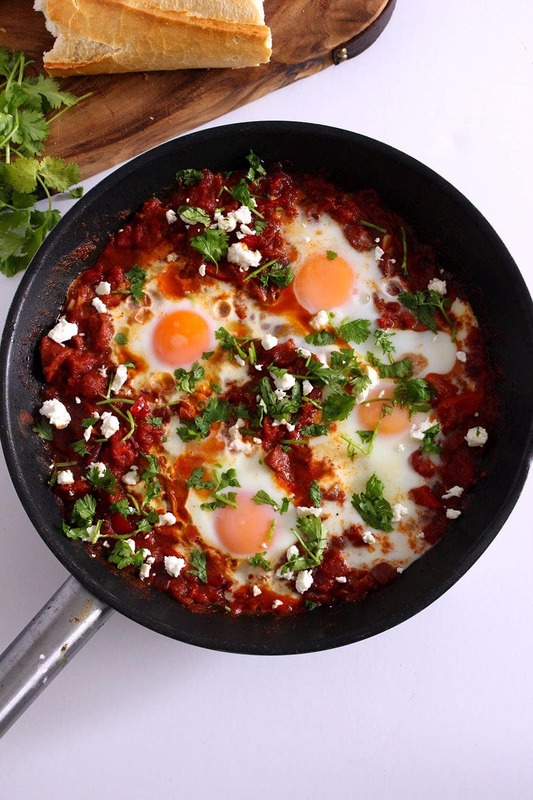 These look so beautifully healthy and also full of flavour! Just the type of food I love to eat.